"A Drop of Light" by Johan's band All Traps on Earth (see previous update) is now available in physical and digital form. You can hear and download the album via bandcamp.com. The CD can be ordered from LaserCD.com in the U.S. BTF.it offer the CD version, the 2-LP version, and - exclusively - the box set version (incl. LP, CD, MC, Poster). While Änglagård are still busy with grocery shopping, there are some interesting news, in particular for fans with tape players: Johan Brand has created a new prog band named All Traps on Earth. The band also includes Erik Hammarström (Änglagård) on drums, Thomas Johnson (ex-Änglagård) on keyboards as well as Miranda Brand (Änglagård's bass player's daughter) in a yet secret function. All Traps on Earth will release their debut record "A Drop of Light" in late 2018 via AMS Records. The label calls the album "far beyond amazing". There will be a limited box-set, a CD version, a 2-LP version, and - yes - an MC version. The band has gone into songwriting mode after several concerts in North America (which happened to include full renditions of "Hybris"). In related news, Jonas, Johan and Erik have apparently started a side project with Thomas Johnson playing some sort of progressive jazz music. In terms of website news, the recent DVD releases have finally been added to the discography. The "Live: Made in Norway"-DVD-BluRay combo is now available from the fan club shop (and also from various prog mailorders). You can also get "only" the audio tracks as download. Änglagård will play in Spain on April 22nd 2017 at Minnuendö festival. In other news, the official fan club is now up and running. Check out the fan club homepage for details, costs, benefits (DVD, posters, newsletter, gear talk), news and the works. More live shows for 2017 have been announced! Canada, Sweden - get ready! Good news: The first couple of live shows for 2017 have been announced! Änglagård will return to the Cruise to the Edge (February 7th-11th). Then, on May 7th, the group will be the Sunday headliner at ROSfest in Gettysburg, PA. Meanwhile, the band is currently is still stuck in the rehearsal room (proof). Finally, I added some details regarding the "Hybris 23rd Anniversary Boxset" (i.e., the track list) to the "Hybris" page. The band is currently hiding in the rehearsal room (proof). The "Hybris 23rd Anniversary Boxset" is still available. A fan club homepage went online, but so far there is little content. In the wake of the Änglagård's Cruise to the Edge shows, a Facebook fan community has sprung to life. Meanwhile, the band is now focusing on writing new material (which might result in a new album down the road). DiskUnion plans to release a "Hybris" box set that contains the original album (on cd) along with a bonus cd containing demo versions of the tracks plus another bonus cd with an old radio interview. The box will come with nice artwork and it will be limited to 500 units. At least that's what I gathered from the automated translation of the Japanese website. Something slightly different and decidedly more British: Thieves' Kitchen have recently released their new album "The Clockwork Universe". Thomas Johnson plays the keyboards and wrote some of the material, but naturally the band has its own sound - complex, flowing, and strangely melodic. Anyway, Johan Brand plays bass on the album and Anna Holmgren and Tord Lindman contributed some parts, as well. Check out the album trailer. Änglagård announced a second concert in Tokyo this year. It will take place at Shinjuku MARZ on November 10th. On this occasion, the band will perform Hybris in its entirety. They also hint at something that smells and tastes like a re-issue of the album on vinyl. Before cruising to the edge, Änglagård will play a concert in the United States. The date is November 13th, the place is Roxy & Dukes (located at 745 Bound Brook Rd) in Dunellen, NJ. Änglagård will return to Japan in November. The band will play a concert at the Takeshiba New Pier Hall on November 8th. Their Swedish friends Anekdoten are also on the bill. The European Tour has been a pleasant adventure so far. No one died. No one even left the band. I'm looking forward to add pictures and other stuff from the tour, soon. Meanwhile, check out the new Progtopia podcast episode about the band (with an interview with Johan and Jonas). After two successful concerts in Italy, Änglagård have added a Paris show (at Le Triton on April 7th) to their current European Tour. Très bon! Tour news! No kidding. As you can see above, Änglagård will play a string of European shows in April including stops in Belgium, Germany, the Netherlands, the U.K. (Chesterfield, London, and Bilston), and Sweden! This is the band's first tour since the infamous American Greyhound Tour in December 1993. Speaking of America - tickets/cabins for Cruise to the Edge are now available. The date and venue of the Rome concert have been changed! (Due to "technical improvement and venue capacity, consequent to huge ticket sales.") It will take place on Thursday, February 5th (one day early than originally planned) at Stazione Birra. Pre-sale has started at i-ticket.it. There is also a crowd funding opportunity in order to cover the costs. Concert news, again! Änglagård will headline the Progressive Circus 2015 festival in Helsingborg on Saturday, April 25th. The show takes place at the Tivoli. Tickets are now available from Tickster.com. Concert news! Änglagård have announced an Italian tour presented by Progressive World, Live eXperiment, and Suoni Paralleli. It starts with a concert in Rome at the Teatro Elsa Morante on Friday, February 6th. It ends with a concert in Milan at the Teatro Giovanni XXIII on Saturday, February 7th. Balletto di Bronzo will also be performing. Online pre-sale will start soon at i-ticket.it. There is also a crowd funding opportunity in order to cover the costs. Änglagård have been added to the line-up of Cruise to the Edge 2015. This means that the band will play on a cruise ship (the Norwegian Pearl) sometime between November 15th and 19th 2015. The ship departs from Miami. Check the Cruise to the Edge homepage for details (as they become available). Änglagård just announced the return of guitarist Jonas Engdegård. The band plans to continue as a six-piece, remarking "We are all very excited returning to the original dual-guitarist concept. This opens up for arrangements and timbers that lies very close to our hearts, as well as giving the audience all the full original guitar scores of the old songs." Hooray! Änglagård will return to Norway next year for a concert with Wobbler on February 21st! The show will be at Musikkflekken in Sandvika. Tickets are available now. Some of last year's tour shirts are now available from Syn-Phonic (in S, L, and XL). 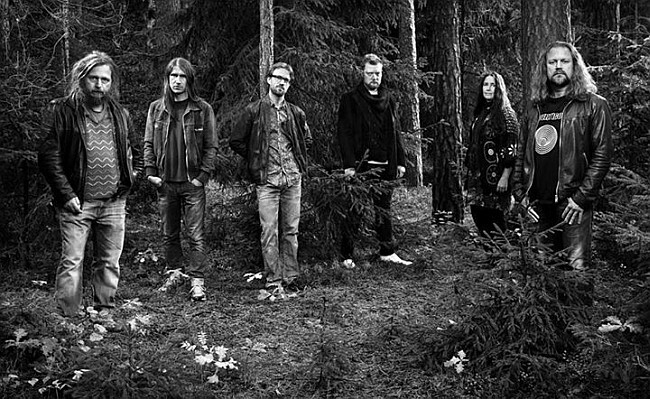 Änglagård were added to the line-up of the 2Days Prog + 1 Festival in Veruno, Italy. From what I can read on the web site, the band will play on September 6th, and the show is supposed to be free. The 2-LP version of "Prog på svenska - Live in Japan" can be pre-ordered at RecordHeaven.net (release date June 20th). They also have some of last year's tour shirts in XL left. To order the 2-CD version (release date May 14th), please go to Alvarsdotter.com or ask your favourite mailorder shop. I added a new interview with keyboard player Linus Kåse to the site. It's all about music, Genesis and socks. Änglagård will make their U.K. debut in August at the Resonance Festival in London on August 3rd. Meanwhile, the new live album "Prog på svenska - Live in Japan" has its own page now with some additional info. Check out the trailer for the upcoming live album (2CD) "Prog på svenska - Live in Japan". It will be released on May 14, 2014. Preorder starts on April 28th on Alvarsdotter.com. The release of the 2LP version is scheduled for June. More concert news: Änglagård will play a show in Mexico on May 23rd, 2014. Check out the Facebook event for details. Meanwhile, the new live album (2CD/2LP) has a title: "Prog på svenska - Live in Japan". And a release date: May 14, 2014. A first review on Progulator is already online. Änglagård are scheduled to play at the Roadburn Festival in Tilburg (NL) on April 11th. The event homepage is a bit confusing when it comes to clear information (e.g., when do they play, what kind of tickets are still available). It looks like a lot of tickets have already been sold. I only found tickets for multiple days left - but I might be wrong (maybe it's already sold out, maybe there's still plenty of tickets). I won't keep you posted, because I'm about to go on vacation. Still, I like these news! All is quiet in Änglagård land. Well, there is some noise because Linus is trying to tune the Mellotron. And then there is the new live album coming up, the band's second after "Buried Alive", which was released back in 1996. Some band members are positive that the new live record is better than the old one. Some band members are still trying to figure out how to write 3-minute songs. And I better stop writing this update now as it makes less and less sense. The last gig of the summer will be this weekend on the Melloboat, which departs from Stockholm on Friday. If you can't make it, you will get the chance to catch a glimpse of the Änglagård live experience in the near future. A live album recorded in Japan this year is currently being produced and will presumably be released through Disk Union. If you don't want to wait, you might want to take a look at a behind-the-scenes video in Japan filmed by Erik and Linus or indulge in this extensive documentation video of this year's Baja Prog with an excerpt of "Jordrök". Finally, I found the Thieves' Kitchen family tree worth a look. From Änglagård's Facebook page: "We want to congratulate our drummer Erik who becomes a father again this summer! He'll be on paternity leave and can not play live for some time. Therefore, we can now proudly present the excellent drummer Jaime Salazar, who is taking over the drumsticks. Welcome to the club Jaime!" Mr. Salazar has previously played with the Flower Kings, Karmakarnic, Last Tribe, Midnight Sun and Allen/Lande among others. You can see the previous line-up with Erik on drums in this live video of "Sorgmantel" (filmed at the Belgian gig on April 27th). Änglagård have played their first shows with the new line-up! There are a couple of reviews of the Japanese shows, as well as pictures from Kawasaki and Stockholm online. Meanwhile, Änglagård are now listed on the billing of Ino-Rock in Poland, which will take place on August 31st this year. The band posted a complete song filmed at the Stockholm gig on February 23rd: "Längtans klocka". A quick reminder: Änglagård will be playing in Stockholm at Bryggarsalen next Saturday, February 23rd. The band posted a rehearsal snippet of "Jordrök" over at YouTube. On a slightly different note, there's this nice write-up of the "Epilog" album by Michael Ostrich (of ProgScape fame) that I enjoyed reading. Maybe you enjoy reading it, too?